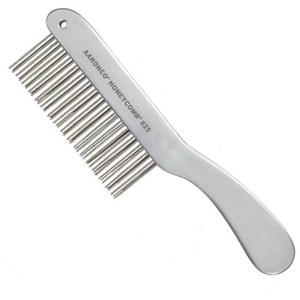 Aaronco 8-1/2 inch Honeycomb Aluminum Handled Double Row Finishing Comb. It's lightweight and fits comfortably in your hand. Sturdy, heavy duty yet lightweight comb is a must have for your tool collection. Designed by Sam and Cynthia Khol. 825 - Double Row Finisher, 51 pins, 1-3/8 inch medium coarse.